Spring Break is right around the corner. If you are looking for the perfect vacation, grab your family and head to Branson! Branson offers something for everyone, especially during Spring Break! There are numerous shows and attractions, shopping, and more! If you are looking for exciting shows that the entire family will love, we’ve got a couple of awesome options! Amazing Pets at Grand Country Music Hall features exciting tricks from skilled dogs and trained rescue cats. Beautiful exotic birds also make an appearance along with numerous other surprises. Be sure to meet the stars of the show afterward! Buckets N’ Boards at the Starlite Theatre is a comedy, rhythm, and music show. This show features amazing percussion, tap dancing, fun songs, and so much more. The kids may even get to be part of the show! Both shows offer a great value for families. Family passes are offered at Amazing Pets for 2 adults and up to 6 children and Buckets & Boards offers family passes for 2 adults and up to 3 children. Family passes are a great way to enjoy a show while saving quite a bit of money! Several attractions in Branson are also sure to bring a level of excitement to any vacation. 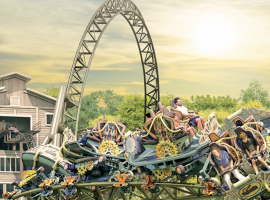 Silver Dollar City opens the 2018 season by introducing their new coaster, Time Traveler. This new roller coaster features a 10 story, 90-degree drop, three inversions, and a tall vertical loop. Check out this ride along with all of the others throughout the park. The Track Family Fun Park is a great place to spend a few hours or all day. There are several locations throughout Branson. The Track features bumper boats, go-karts, bumper cars, arcade games, and more. Be sure to check out their famous Branson Ferris Wheel. Ride it at night for a special view of all of the stunning lights in Branson. The Titanic Museum is also a great place to spend a few hours of your day. There are numerous exhibits that showcase the history and events of the Titanic. Guests love the interactive exhibits and the stories that are told throughout the exhibit. If you love to shop, you are guaranteed to find the perfect spot in Branson. Tanger Outlets is located right off of Highway 76. This outlet features stores such as: Disney, Under Armour, Nike, Kate Spade, Vera Bradley and many more. The Branson Landing, a shopping extravaganza that borders Lake Taneycomo, offers beautiful views, delicious restaurants and name brand shopping! The Landing is located in historic Downtown Branson and features numerous stores such as: Bass Pro, Belk, Build-A-Bear, and Versona. The Landing also features several memorable restaurants like Cantina Laredo and White River Fish House, and provides great views of Lake Taneycomo. If you are looking for a unique shopping experience, The Branson Mill is the place to go. This shopping center is over 60,000 square feet and showcases several working craftsmen and women. Guests will be sure to find the perfect, hand-crafted Branson souvenir! It is easy to see why Branson is the perfect place to spend Spring Break. From all of the shows and attractions to the variety of shopping experiences, there is something that every family member will enjoy. Create memories that will last a lifetime, right here, in Branson! Click HERE to begin planning your vacation now!